1Department of Mathematics, University of Hormozgan, Bandarabbas, Iran. 2Department of Mathematics, Sirjan University of Technology, Sirjan, Iran. In this paper, we introduce the concept of the generalized topological molecular lattices as a generalization of Wang's topological molecular lattices, topological spaces, fuzzy topological spaces, L-fuzzy topological spaces and soft topological spaces. Topological molecular lattices were defined by closed elements, but in this new structure we present the concept of the open elements and define a closed element by the pseudocomplement of an open element. We have two structures on a completely distributive complete lattice, topology and generalized co-topology which are not dual to each other. We study the basic concepts, in particular separation axioms and some relations among them. A.R. Aliabadi and A. Sheykhmiri, LG-topology, Bull. Iranian Math. Soc., 41 (2015), pp. 239-258. T.S. Blyth, Lattice and Ordered Algebraic Structures, Springer-Verlag, London, 2005. G. Bruns, Darstellungen und Erweiterungen geordneter Mengen II, J. Reine Angew. Math., 210 (1962), pp. 1-23. 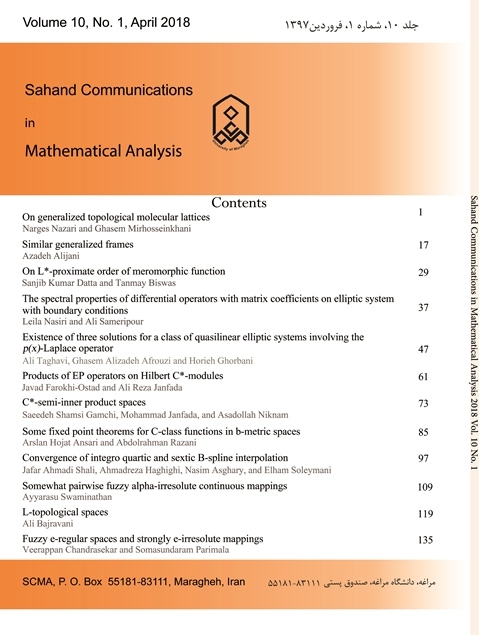 K. El-Saady and F. Al-Nabbat, Generalized topological molecular lattices, Advances in Pure Mathematics, 5 (2015), pp. 552-559. P.T. Johnstone, Stone spaces, Cambridge studies in Advanced Mathematics, Cambridge University press, cambridge, 1982. Y.M. Li, Exponentiable objects in the category of topological molecular lattices, Fuzzy sets and systems, 104 (1999), pp. 407-414. J. Picado and A. Pultr, Frames and locales, Topology Without Points, Frontiers in Mathematics, Birkhauser-Springer AG, Basel, 2012. S. Roman, Lattice and ordered sets, Springer, New York, 2008. W.J. Thron, Lattice-equivalence of topological spaces, Duke Math. J., 29 (1962), pp. 671-679. G.J. Wang, Theory of topological molecular lattices, Fuzzy Sets and Systems, 47 (1992), pp. 351-376. G.J. Wang, Generalized topological molecular lattices, Scientia Sinica, 8 (1984), pp. 785-798.